The Zeo sleep management company launched a sleep tracking device and mobile application last year that enabled users to track their sleep and monitor their activity throughout the night in order to get the right amount of rest and feel much more alive and kicking in the morning. However, if you’d rather not invest in a dedicated gadget, Zeo has now brought out a completely free app that provides you with similar results. Just like the original Zeo Sleep Manager, The Sleep101 application tracks your sleep and then allows users to monitor how their patterns change and even serves up advice about how to get a better night’s rest too. 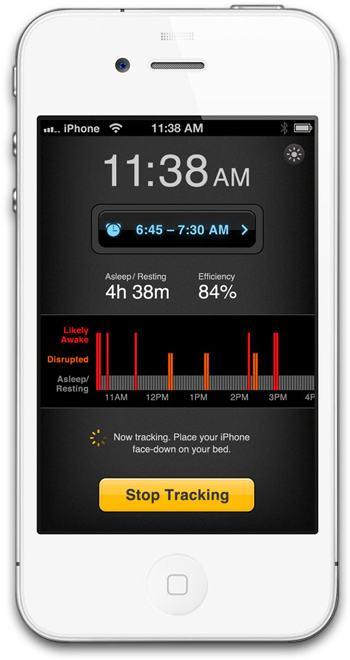 Sleep101 works by using the accelerometer within the iPhone to measure movements and draw up results about how long you were awake and asleep throughout the night. You can then track this data over time to pinpoint what may have caused specific problems. The app is handy because it doesn’t just rub in the fact you don’t sleep well, but it provides you with advice about how to improve, such as changes to your diet or your bedroom environment, and challenges you to kick start your progress. Like some other alarm clock and sleep management apps, Sleep101 also uses its accelerometer technology to wake you up at just the right time in your morning sleep cycle. Although gadgets that attach to your body are going to give you better results, the team at Zeo suggest the app is still 86% as accurate as other methods, so if you’re concerned about your sleep but don’t want to invest too much time and money into something more expensive and complicated, Sleep101 would be ideal. The Sleep101 app is available from iTunes for free.